Last Tuesday, Structured Liberal Education (SLE), Stanford’s residential humanities program, invited renowned Iranian scholar Abdolkarim Soroush for a guest lecture on Rumi, a 13th century Persian Muslim poet. Although Professor Soroush spoke mostly on his area of expertise and Rumi’s book, Swallowing the Sun, his talk also vacillated between fact, opinion, and, unfortunately, anti-Semitism. During the hour lecture, he orated eloquently, conveying the text’s unique quality in its original language and expressing clear knowledge of the topic being discussed. He was careful with his words, and having spent many years in the United States, was clearly fluent in English. Fudging the numbers of Jews killed is a common form of Holocaust denial, present in the rhetoric of anti-Semitic figures ranging from the Nation of Islam’s Louis Farrakhan, to author and once accepted historian David Irving. The following day, SLE arranged for discussion sections to fixate on the issue, with time allotted ranging from fifteen to forty-five minutes, but one section chose not to discuss Professor Soroush’s comments at all. Even worse, though Landy and co-director Jeremy Sabol mentioned briefly that SLE doesn’t agree “with the comments made by Professor Soroush,” SLE has yet to pull Stanford-subsidized transportation to Professor Soroush’s February 16 public lecture in San Francisco. Landy said he will recommend that Soroush not be invited back to guest lecture next year. 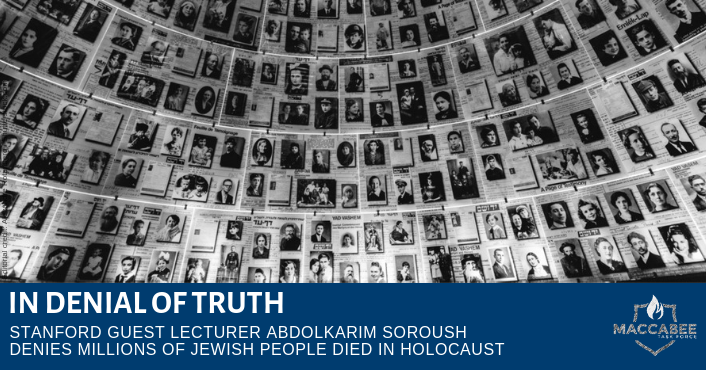 In my discussion section, students born in the Middle East, or who had Middle Eastern parents, explained how Holocaust denial was a common occurrence and that the professor’s views were fairly representative of the anti-Semitic views they were taught as fact. Understanding the context for this Professor’s opinions in no way justifies such statements, but it does demand us to educate, so that we properly remember past atrocities and ensure, to the best of our ability, that no such disasters happen again. For more information on Holocaust ignorance and denial in America, click here. For specifics pertaining to independent countries, click here. For more statistics of denial on a global scale and by demographics, click here.